Orthopedic surgery including cruciate ligament repair, patellar luxation repair, hip luxation repair, femoral head ostectomy, repair of long bone and Salter fractures using Steinman pinning, K.E. Apparatus external fixation, and amputations. Thoracic surgery including lung lobectomy, thymectomy, diaphragmatic hernia repair, and chest wall reconstruction. Plastic and reconstructive surgery including entropion, ectropion, conjunctival flap and conjunctival graft surgery, plastic surgical and non-surgical closure of massive wounds, skin grafting, neonatal eyelid reconstruction, and ear resection and ablation surgery. Other surgical procedures including skin and eyelid tumor removal, eye enucleation, repair of prolapse of the gland of the nictitating membrane, salivary mucocele repair, abscess and foreign body surgery, thyroidectomy, electro-surgery, laser surgery, and cryosurgery. Dr. Michael Trapani (A.S., B.S., D.V.M.) was born in San Francisco and grew up in Redwood City, California. He attended San Carlos High School, then Cañada College, San Francisco State University and the University of California at Davis, where he obtained his Doctorate in Veterinary Medicine in 1982. Dr. Trapani began his career in the little town of Rough & Ready, California as a small animal and equine practitioner, but was forced to choose between caring for horses or companion animals when he opened his own veterinary practice in Grass Valley in 1985. His desire to perform complex surgery led him to choose companion animal practice, but his interest in the care of many different animal species continued and found outlet in his work with injured wildlife. Dr. Trapani believes that no act of compassion is ever wasted. He has been an active supporter of a number of humane and wildlife care groups during the last 28 years, volunteering his time to care for hundreds of needy pets and injured wildlife, including owls, hawks, eagles, and sea birds; his patients have included everything from injured sea lions to fish and sick banana slugs. Dr. Trapani owned and operated For the Love of Pets; his veterinary hospital in Grass Valley, for nearly 23 years before changing life circumstances forced him to sell the practice. He left Grass Valley to live in Bodega Bay and began a new phase of his career working for non-profit humane organizations. 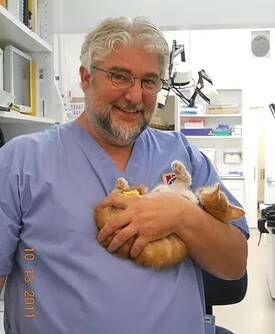 He spent six months organizing and optimizing a humane society veterinary practice in Sebastopol before moving on to optimize a mobile low-cost spay/neuter practice for another humane group in Nevada County. He would later take on the optimization of a low-cost, high volume spay/neuter clinic in Stockton, California, where he once performed a record 42 spay/neuter surgeries in under 4 ½ hours as part of that organization’s effort to end the needless killing of tens of thousands of animals each year in the area’s animal shelters. Thus far, he has performed an estimated 25,000 spay and neuter surgeries in the course of his career. Dr. Trapani is, at heart, a small town veterinarian. After five years with non-profit groups, he felt he’d made his contribution to animal over-population control and wanted to get back to his roots in family veterinary practice. When a suitable space became available in Bodega Bay, he and his partner Barbara seized the opportunity to build his fourth and final veterinary hospital. Dr. Trapani considers himself something of a dinosaur, a holdover from a time when the only veterinary specialists were those teaching at the university. With no specialists or big-city specialty centers available to refer difficult patients, rural practitioners of Dr. Trapani’s generation had no option except to handle difficult cases on their own. This often meant performing surgical procedures that many contemporary veterinarians routinely refer to specialists because, in those days, the only other option was euthanasia of the patient. A partial listing of Dr. Trapani’s experience with surgical procedures is appended.